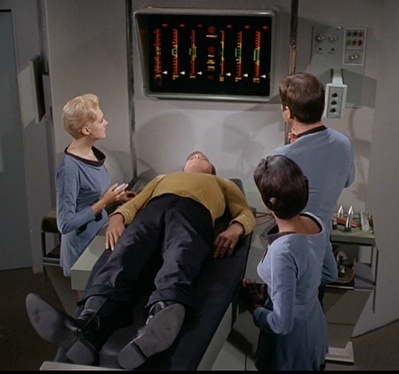 A Star Trek-style patient bed is under development by doctors at the University of Leicester. Designed to detect everything from bruising to cancer, the unit was developed as a byproduct of a joint project with NASA aimed at detecting the presence of life on Mars. The unit is equipped with a set of instruments which analyze a patient's breath, as well as another set that uses visual imaging to examine a patient's skin. 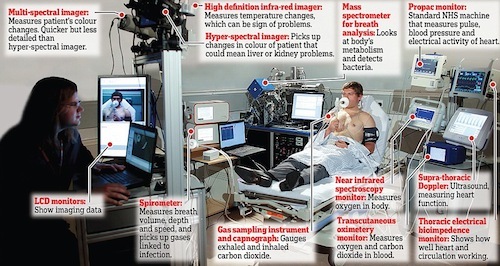 A third suite of monitors looks inside the body and measures blood-flow and oxygenation in real-time. The team believes the equipment can be used to diagnose over 40 diseases, from sepsis through to bacterial infections such as C. Difficile and some cancers. It's the first time all these technologies have been brought together in an integrated way - and developing it involved scientists working in space research, emergency medicine, engineering and IT. "We are replacing doctors' eyes with state-of-the-art imaging systems, replacing the nose with breath analysis, and the 'feel of the pulse' with monitoring of blood flow using ultra sound technology and measurement of blood oxygen levels," says professor Mark Sims, a University of Leicester space scientist. Via TGDaily and The Guardian; thanks to Winchell Chung for pointing this one out.